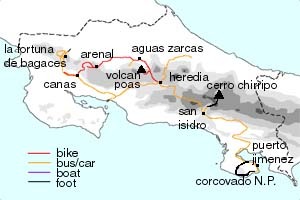 …these stories of our bike tours have been resurrected form our second website which was created in 1999. The first website we built was called cyclerica (get it…Cycle and Rica…) and was hosted on a Canadian provider called redrival.com several years earlier so my grandmother could see photos from our honeymoon. Our luna de miel in Costa Rica was a chance to discover just how huge a little tiny country can seem. Without a doubt the best part of this trip was the friends we made, but we also enjoyed Arenal volcano, a backpacking trip around Corcovado National Park, Climbing Chirripó (the highest peak in C.R. ), and the hike up the river to the waterfall on the flanks of Miravalles volcano.